1933. From Model Engineer and Practical Electrician of 9th November. THIRTY years ago the now famous Ever Ready Company began business in a shop in Charing Cross Road, which, with a handful of workpeople, also served as a factory. To-day the company has no less than 28 factories in all of which eight are in the London area. Altogether their factories cover a space of one and a third million square feet, and employ over 12,000 people. 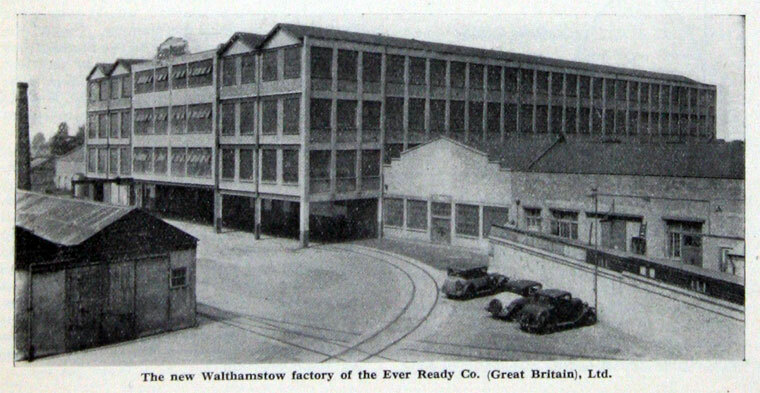 Our illustration shows their latest factory in the metropolitan area, at Walthamstow. It has been built for the manufacture of radio high tension batteries and dry cells for electric torches. It has a floor area of 175,000 square feet, and will give employment to 2,000 hands. It is specially designed to permit of every stage of dry battery manufacture being carried out, and represents the experience of the Ever Ready Company accumulated through their many years of trading. The ground floor is devoted partly to a mill which crushes the raw manganese dioxide, and partly to production lines on which finished cells are made up in battery form and sealed and packed for market. Work on the dry cell, whether intended for torches or radio batteries, starts on the top (third) floor, to which the powdered manganese dioxide is forced under pressure from the ground floor mill. Twelve cup soldering machines produce the complete cups which form the casing for the dry cell. The cups are made from strip zinc, which is fed into the machine from a roll. The zinc is folded into cylindrical form, a base inserted, and then passed on to the spokes of a rimless wheel, where the base is firmly soldered into position. The finished cups are fed automatically under nozzles and machines which insert the requisite amount of electrolyte and also insert the insulating washer at the bottom of the cup. Conveyors then take the cell through a hot water bath to set the electrolyte. The final stage in this machine is the fitting of a brass cap to the electrode and the sealing of the cell. Every torch cell is subjected to a voltage test by means of a photo-electric cell which automatically rejects any cell which falls below a definite voltage. A striking example of the high class quality of the torches made by this company is provided by the experience of last summer's Mount Everest Expedition. A member of this Expedition found an Ever Ready torch that had been dropped nearly ten years previously by an earlier expedition. It was still in perfect working order. In a speech at the opening of the new factory the Managing Director said; "Those pessimists who predicted the eclipse of the battery industry with the coming of the all-mains set are false prophets. It is a fact that the present sale of batteries and battery sets is greater than ever before, and the growth has been greater, in proportion, than that of all-mains sets. In spite of the progress of the Grid, which most of us welcome, the vast majority of the houses in this country are still without electricity, and will remain so for a number of years to come, while there are many people, whose homes are electrified, who prefer the purity of tone and economy of operation obtainable from battery-operated sets." The company's productions are not limited to batteries for radio. They make batteries for many other purposes, such as hand torches and for use on motor cars and cycles. Recently, for example, they received a large order from the General Post Office for the supply of electric battery lamps for postmen and for the cycles of telegraph boys. Many of their products are designed for use in mines, submarines, inflammable fuel tanks and other dangerous places, where a single fault would mean the difference between life and death. November 9, 1933. The Model Engineer and Practical Electrician. This page was last edited on 24 October 2008, at 07:02.